Ferris Oval Address Plaque Sign - - personalized address sign holds up to five (5) large 3" characters. Wall mount or lawn mount with optional lawn stake. Made in USA. The stylized border, which is slightly wider at the top and bottom than it is around the sides, adds an unexpected hint of whimsy to the otherwise elegant simplicity. 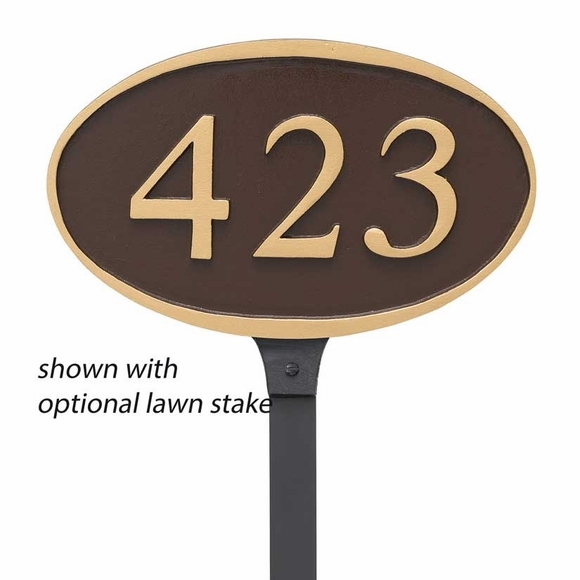 Available with or without one 23" lawn stakes. Recycled cast aluminum construction. Characters and border are integral components of the sign, not added on. Made in the USA.